Her family came over from Scotland and settled in the thumb region of Michigan and lived there for more years that I can remember. She lived a life that was long and full and she loved every minute of it. 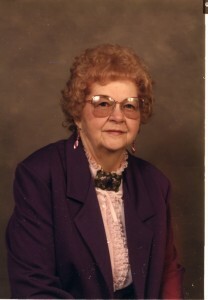 Parents, siblings, husband, children, grandchildren, and great grandchildren were all part of her life on a daily basis. Year in and year out she was surrounded by family. Full of life, love, and the joy of travel. It wasn’t uncommon for her to take off on a whim without letting anyone know…. then again she would also check herself into the hospital if she didn’t feel well without telling anyone too. My memories of her are dear to me and I hold them close to my heart, pulling them out like pictures and flipping through them from time to time. Remembering the times we spent together are special to me…. but few. Fewer than I would hope for, but more than others I suppose. There were things she missed that I had always hoped she would see, but her heart was tired. It was her time. She is loved and missed dearly by all. Daughter. Wife. Sister. Mother. Grandmother. Great Grandmother. She watches us and all we do. She smiles with us and cries with us. She loved and was loved in return. She is at peace now.